Sometimes when you have something on your mind the grain of an idea or a pre-popped kernel of truth, you start to see the lines of invisible connection weaving their way through everything around you, you look at your surroundings through a coloured lens shaped by the thoughts inside your head so desperately trying to birth themselves. I am not an architect, but I do have a journeyman's interest in Urbanism and the interaction between the physical structure of cities and their inhabitants. A few years ago I attended a workshop organised by the City Planner that brought together planners, architects, academics and, for reasons still unfathomable, me, to discuss what was then just the draft City Development Plan. While my contribution was minor, centring on the need for actual common spaces that were public areas, not privately owned commercial "town centres", in which the citizenry could congregate and connect, when I advocated for more mixed-use development in the city centre, with residential, commercial and retail space all occupying the same sphere (mixed-used buildings are the most sustainable form of urban architecture), the curt reply came that "well we don't want to go all Corbusier now, do we?". At the time my familiarity with Le Corbusier was mainly with the Cité Radieuse (Radiant City), his first Unité d'Habitation in Marseille, built between 1947 and 1952 to house many of those left homeless by the war. Le Corbusier's idea was that people should be able to live, work and play all within the same building, never needing to leave if they so chose except for the occasional spot of recreation in the carefully sculpted parks that would surround each high-rise building. His vision of a Brutalist (from the French "béton brut", or "raw concrete") cityscape dominated by isolated towers rising high between the manicured greenery and miles of open highway influenced a generation of architects, his lines can be seen even here in Dublin throughout UCD's campus, in Trinity's Arts Block and most especially in its Berkley Library. The construction of the UCD Campus always struck me as being particularly unfriendly and hostile, and I remember being told that as it was built during the 60's, the College Board feared the threat of mass student protests so instructed that it be designed with no open spaces to allow for demonstrators to congregate, indeed the whole of the campus from that period has a feeling of a fortified bunker, designed to protect the college from the students, funnelling them from building to building and discouraging as much human interaction as possible. There is an irony here that when activists were looking to replicate the Occupy Wall Street protests in Dublin, the only open space in the city centre that they found to be suitable was under the eaves of Sam Stephenson's Neo Brutalist monument to commerce, The Central Bank. This, for me, is the quandary of Brutalism, that while Le Corbusier said that it was design on a human scale, for those who had to endure it it was soul-crushing, a heavy weight placed upon them that made life itself a chore. There was a fantastic documentary a night or two ago on BBC4, Trouble in Utopia, part of the The Shock of the New series made by the late Robert Hughes (who passed away early last month) and first broadcast back in 1980, that explored the birth of modern architecture with a particular focus on Mies van der Rohe and Le Corbusier. 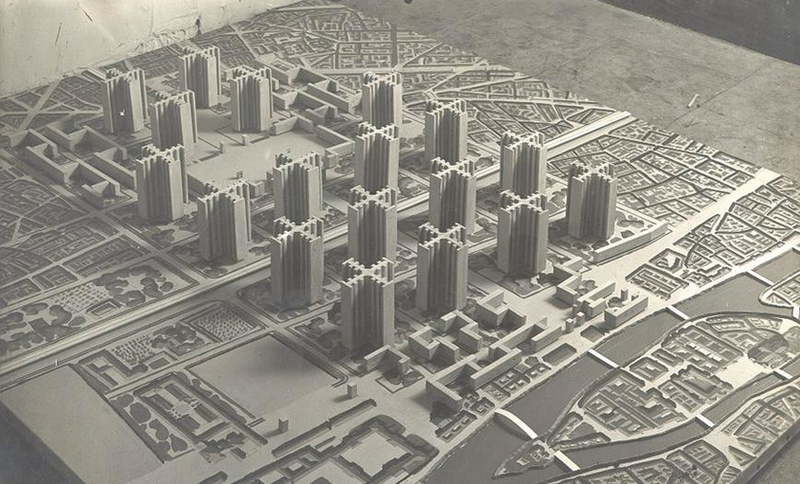 With interviews with some of their students, and extensive walk-arounds in their buildings including the Cité Radieuse and Le Corbusier's planned city of Chandigarh in India, Hughes' thesis was that planned utopias like these are a disaster from concept to implementation, that the architect cannot act as god and try to map out every aspect of an inhabitant's life, that cities must evolve organically to meet the living needs of the citizenry. Le Corbusier's Unités d'Habitation gave birth to the banlieue of Paris and the Projects of the US and left cities scarred with lost generation after lost generation, trapped and forgotten in their concrete tombs, and even as a teenager I was familiar with Le Corbusier's legacy thanks to the British comic 2000AD and its futuristic Mega-City One, home of the helmeted fist of justice, Judge Dredd. Dredd's city is populated with Blocks, massive skyscrapers that serve as home to thousands of inhabitants, mostly unemployed and few ever leaving the confines of their building, the Radient City writ large. Violence and deprivation is the norm, the architecture itself serving as enemy as much as shelter, and yet in the pages of 2000AD the Blocks rubbed shoulder to shoulder, giant bulbous mushrooms rising high to the sky painted in glorious Technicolor that lept off the pages standing in stark contrast to the misery of those who lived inside. I went yesterday to see Dredd, the latest screen incarnation of the titular lawman, and without passing judgement on the film itself I will say that what struck me was the reimagining of Mega-City One itself. Gone were the sweeping colours and overcrowded skyline of Brian Bolland, and in its place were lone skyscrapers rising singularly from a nest of favellas, scattered amongst the never-ending warren of highways and overpasses, looking like they had stepped straight off the plans for Le Corbusier's 1925 Plan Voisin for Paris, and I did a double take when viewing the interior of Peach Trees Block (the setting for most of the film), half expecting Robert Hughes to come walking through decrying the futility of its construction. There is something about the Brutalist vision that remains futuristic, despite it being half a century old and more, but perhaps it is our experience of the reality of this style that the vision it evokes is one of a dystopian dehumanising horror. When filmmakers want to portray a nightmare authoritarian future, the backdrop they often use is Brutalist, whether Dredd's Corbusien Mega-City One, or Paul Verhoeven's original Total Recall, shot mainly in Mexico City in and around a Neo Brutalist military academy and the Metro (particularly the Metro Insurgentes station and accompanying shopping centre). Given that Dredd was shot entirely on location in Capetown there is an interesting discussion for another day on the fact that for Hollywood the vision of a future urban nightmare is often the contemporary global South. Which brings me back to the City Development Plan and the meeting with planners and architects. While we may never see another Central Bank rise again, the concrete wastelands of Bride's Glen remind us that the developer's love of brutalism has never gone away, and with the collapse of the property bubble our whole country has been relegated to a half-finished building site of windowless shells and exposed iron rods poking up like gravestones from the rotting corpses of abandoned foundations. Our planners' fear of a Corbusien dystopia has engineered in some a hatred for the city itself, with mile after mile of green land on the outskirts rezoned for yet more exurban fantasies that will never be completed, sucking the lifebood out of the city and transforming people's lives into an endless journey, with commuter-belt neighbourhoods devoid of life as all people do there is sleep, and the centre itself is left to rot under an avalanche of decay and filth as it is abandoned to the bars and nightclubs, with no one caring for the urban environment around them as they don't live there, only passing through it as a darkened toilet on their way from pint to bed elsewhere, many miles elsewhere. "What is gone and I think gone for good is the idea that architects or artists can lay the rudiments of paradise here on Earth and construct working utopias. Cities are more complex than that, you cannot purify human needs without taking away human freedom. In any case you have to work with the real world and its inherited content, and memory is reality." but what generations of Dublin planners have done is exactly that, they have forcibly cast aside history to embrace the lucrative business of The New, from the sundering of inner city communities and their forced relocation to the planned "communities" of Tallaght and Ballymun (without any of the amenities that would have evolved in an organic community), through to the destruction of Georgian Dublin to make way for rows of now-empty office blocks, capped off by the greatest piece of Brutalist architecture the city has ever had to endure, the Civic Offices themselves on Wood Quay wherein the city planners dwell. With the Celtic Tiger things moved up into overdrive, with the City itself sprawling out further and further along imaginary corridors, the populace urged to climb up on to the property ladder, with the centre home only to a transient population desperate for escape, an escape that leads further and further out beyond the leafy suburbs and into the concrete and asphalt exurbs of Adamstown and the wastelands of Cherrywood, where the mistakes of Tallaght and Ballymun are already being made again but with three-floored yellow bricks instead of fifteen storey tower-blocks of grey. You cannot construct a community, it has to be allowed to grow. "Well we don't want to go all Corbusier now, do we?" said the Planner to me, but their fantasy of an exurban paradise in Adamstown, Cherrywood and beyond betrays just as much hubris as the Plan Voisin, and only time will tell if the citizens of this new Dublin have the strength to escape its architecture.